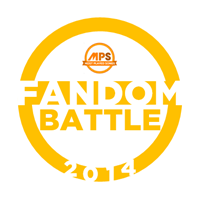 MPS Fandom Battle 2014 is the 1st installment of MPS Fandom Battle for giving honor and appreciation for those fans who give their 'endless support' for their favorite artist. The concept of this poll is 'matira matibay'. There are 2 categories: OPM Artist Fandom and International Artist Fandom. The battle began on September 1. It consists of 4 Battles. Unlimited voting was implemented throughout the 4 battles. The awards night held on October 18 in celebration of the page's 2nd Year on Facebook. e-Certificates were given away to the grand winners. with highest percentage of votes per category advanced to the next battle. Battle 2 - the top 5 fandom with highest percentage of votes advanced to the next battle. again. The fandom with highest votes per category occupied the last 2 spots for the Final 6. ​ to win or to lose.